Ok, time for you, the reader, to chime in on.... 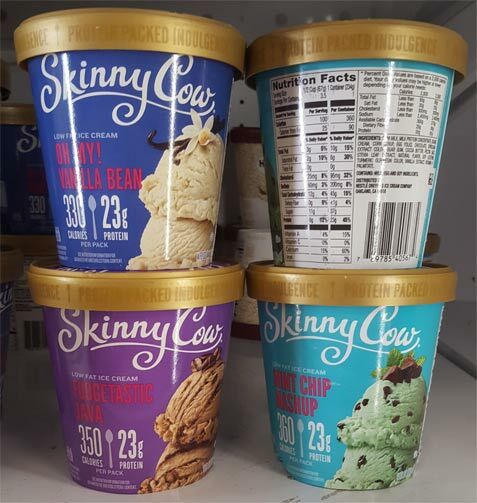 Skinny Cow low fat ice cream pints. These were first spotted way back in August (of 2017) but I just spied them today, sitting on a Haagen-Dazs shelf of all places. Since Stevia isn't really my thing, I'm opening the floor up to hear what you think. Why do these pints always seem to have a spoon drawing on them? When I picked up that top right pint to spin it around to show nutrition info, I was shocked out how light it was. I do realize that these low sugar, high protein pints are a good amount of air, but the pint felt practically empty. So, have you seen these? and if so, have you tried them? which ones? how would you rank them? I got a couple of positive comments on instagram so maybe you've had a similar experience. I've seen them at Target, but haven't bothered with them. I like trying new things, but am tired of wasting my money to try things like Halo Top and Enlightened and Low Sugar Talenti. None of them are awful, but they're not really worth it, in my opinion. I'd rather have a bite or two of some really fantastic ice cream than an entire pint of mediocre fake stuff. I tried the mint chip one, thought it was awful. Maybe it was a bad batch, but the texture was gummy/chewy. Your comment about how light the pint felt made me think of how I now pick up pints of Halo Top or the Breyer's Delights and pick the ones that feel heavier. I have gotten a few that either weren't filled entirely, or they were almost desiccated/dried out. It was weird. I'm not going to try them. Have tried Halo Top, Enlightened and Low Cow and their just not good enough to re-purchase. Think these will be similar. They will be overpriced to boot. I like Halo Top. It's my go to summer lunch when it's on sale. My lunches are normally 1k calories, so it cuts a lot of calories. I usually find stevia too sweet, though. i think i associate any ice-cream that's low fat with "air" and if i pick up a pint and it's super light, i certainly wouldn't be impressed. i am not from the US (i am from Bahrain) but we do have a lot of US brands here that i have been able to find (anywhere from Talenti to Coolhaus to Halo Top, etc). i find stevia to have this strange aftertaste... and i have yet t try Halo Top because the only flavours they stock around here are chocolate and chocolate-chip mint. both of which i don't think are that worth the splurge of price! we don't have Skinny Cow here but even if we did, i wouldn't try these... they just don't look fun even if they weren't low-fat ice-cream. I liked the Oh Fudge Cookie one I had. I actually found the texture great. It was thick and rather... well, fudgy! Can’t say anything about the other flavors and I might have been lucky with my pint. But I would but thaycsorcific flavor again based on my experience.